After a summer of fun and frivolity and canoeing and a less fun autumn of knocking some items off the honey-do list, it was time to return to my beloved stripper. Yes, she waited patiently for me in the garage, neglected for far too many months. I was glad to get back to her. 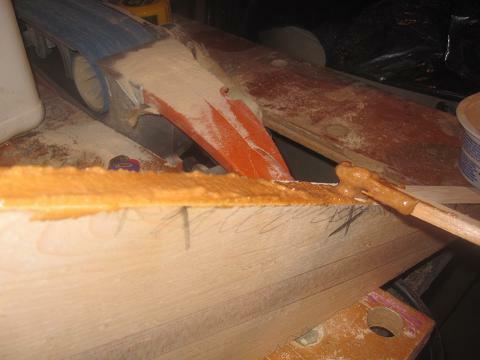 At any rate, when I left the build, I had fiberglassed the hull and had sanded most of it inside and out. It was time now to start putting things together. 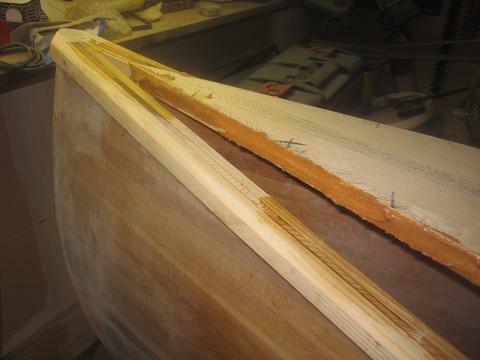 The last canoe had a solid ash internal gunwale. For this boat, I decided to construct a scuppered gunwale. Why scuppers? For one, I like the look of them. As well, they provide drainage and convenient tie-down points and the end result is lighter than a solid gunwale of the same width. I started by scarfing two 10′ lengths of ash, roughly half an inch thick. 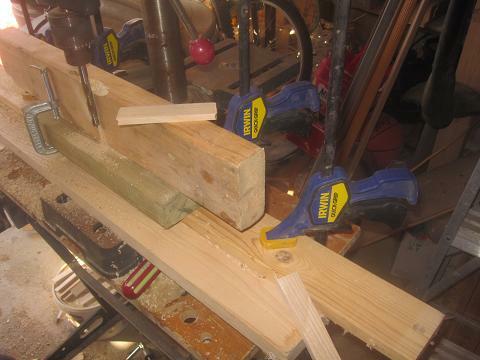 Then I set up an ugly but functional jig to create 3 inch long blocks out of 1/4 inch thick ash. The “C” clamp in the picture below acted as my stopper. 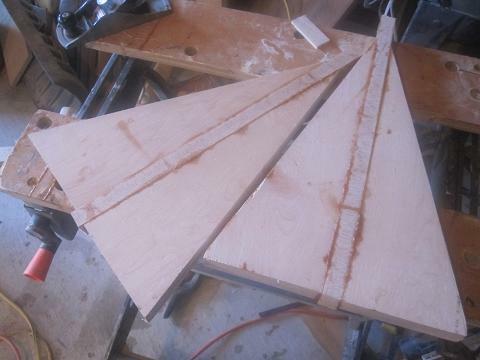 The drill press enabled me to have a nice concave shape at the ends of the blocks. Then I had a beer in the sunshine with my trusty helper. And then a couple more after which we decided (wisely) to put the tools away, because boat-building and booze is second only to boating and booze in the annals of really bad ideas. Installing the gunwales is a finicky business and you want to be stone cold sober when you do it. 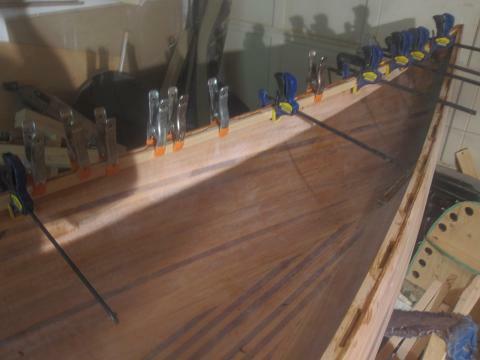 You want a nice join at the ends where the two gunwales meet, and you want to make sure that you don’t cut the gunwales too short. 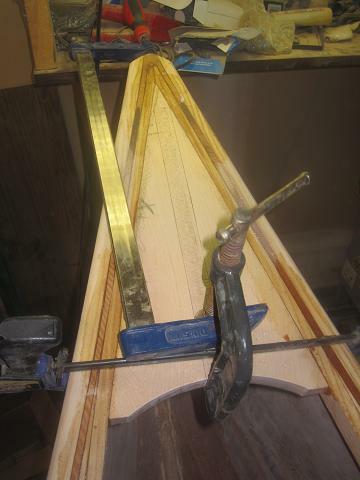 It’s remarkable what bending and twisting the gunwales does to what you thought was a perfect measurement. At any rate, the gunwales went in without too much in the way of trauma, and after dry-fitting them, it was time to epoxy them into position. 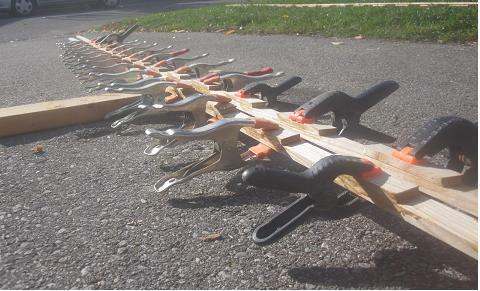 I think I mentioned that you can never have enough clamps when building a canoe; I think I used every one I had when mounting the gunwales to the hull. You are currently viewing the archives for November, 2011 at greybeard canoes & kayaks.